Last week after RIM announced a $125 million loss in Q4, several executives resigned from the company. The losses included David Yach, CTO, Software for RIM, Jim Rowan, COO, Global Operations, and former co-CEO Jim Balsillie resigning from the board. Apparently the damage toll continues to rise at the struggling company. Yesterday a spokesperson for RIM said that Alistair Mitchell, Vice President for the BlackBerry instant-messaging service, has left the company and Alan Brenner, Senior Vice President of the BlackBerry platform will depart after a transition period. RIM has suffered a 14% loss in global smartphone market share leaving the once industry leader with only 8.2% of the market. On the financial side, RIM’s stock has fallen 77% in the past year, leaving its shares at $12.67 at the close of business yesterday. Last week, Thorsten Heins, who has been CEO since January, said that RIM is moving its focus to business customers. He also said that RIM is weighing other options such as licensing its BlackBerry platform. Finally, he said that a sale of the company would be considered as an option, although that is not the “main direction” for RIM’s strategic review. RIM should be renamed to RIP..
Its always a good idea to stop singing when the sound is good. I love my 64GB Playbook & my Bold 9900... f**k the world...!!! RIM! Dont u get it? People loves update.. A free update!!! Not like what you are doing.. New OS means new set of phone! 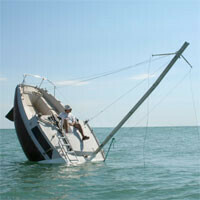 the sinking boat is perfect. the only thing that would make it better is if it were a million dollar yacht going down to signify their old status. So far I like this new guy. I didnt have much hope that he was more than a puppet in the dual CEO retard game, but he's really pushin things around. Get rid of all the old guard and start fresh, thats the way to do it. Especially when theyve all but burned the company down. 2012 is their make or break year in my mind. They still have a chance, if they pull their finger out, push out some phones with the new OS, get developers on board asap, and get an OS update schedule they can actually meet. Failing that, I see them being sold or going under. The fall will simply gain too much momentum after 2012 if there are no signs of a real co ordinated smartphone strategy. In the past few years its simply been too much of a gong show.